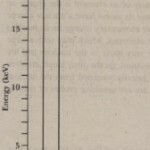 Moseley’s experimental data, of which the Moseley plot of is but a part. can be used directly to assign the elements to their proper places in the periodic table. This can be done even if no theoretical basis for Moseley’s results can be established. However. there is such a basis. According to Eq. 40-24 the energy of the hydrogen atom is.